What’s not to love about Ave Maria in February? It’s typically 70 degrees and sunny, you can spend the day on Del Webb’s Panther Run Golf Club, followed by lunch at Tropical Smoothie and a sunset stroll along one of the many pathways and trails around town. Best of all, Ave Maria is packed with outdoor events in February. Come out and join the fun, there’s something for everyone when we celebrate winter in Southwest Florida sunshine-style. February 5th and 6th mark the first Arts & Crafts Festival in Ave Maria. Over 40 artists showcasing photography, painting, sculpture and more will fill the town center. Guests will speak with artists to learn more about their craft and discover new favorites. Visitors can also jump on a free trolley tour on Tuesday to learn more about the town of Ave Maria. 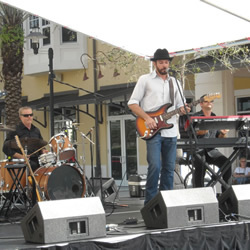 On February 23rd Ave Maria hosts its an nual Blues, Brews & BBQ outdoor music festival. If you’re a lover of all things barbeque, beer or blues, then this event is perfect for you. You can bring your lawn chair, enjoy the outdoor concert by local favorite blues bands and sample food from several local food trucks. A car show and many local vendors will line the town center providing a day of outdoor fun in the sun. Free trolley tours are available every Tuesday and Thursday in February with live music in the town center on Thursday afternoons. The 45-minute trolley narrated tours are a longtime favorite for many visitors and also a great way for new home buyers to tour the town and learn its history. Board the trolley at the Ave Maria New Home & Welcome Center and be sure to call ahead to reserve your spot because tours do fill up. On Saturdays, the Farmers Market is open to the public with local vendors featuring fresh produce and citrus, seafood, soaps, candles, honey, and clothing. Our Town Center events are the perfect way to experience Ave Maria, meet new friends, sample some new foods, and simply enjoy the warm winter sunshine in our Southwest Florida dream destination.